I thought it would be fun to start the new year off with my new printable paper doll series- The Sprites. So, for the whole month of January, every Friday will be a new Sprite paper doll. The Sprites are really close to being Pixie & Puck 2.0, but I wanted to give them a whole new name since they absolutely can not share clothing with Pixie and Puck.. Unlike Pixie and Puck, the Sprite printable paper dolls will feature the same faces over and over again, much like Marisole Monday & Friends and the Mini-Maidens. Unlike Marisole Monday & Friends, all Sprite paper dolls will be in paired themes. So, today we have Zachary, a male cyberpunk paper doll and the next Sprite post (which will be next week) will be a female cyberpunk paper doll. There will not always been two Sprite paper dolls in a row, just to clear that one up. I mean, I suspect there usually will be, but I also suspect that me promising there will be will only end in a stressed out Rachel. No one wants that, right? So, after some debate, I decided to name my Sprite base paper dolls in reverse alphabetical order. Why? Because it seemed like a good idea at the time. 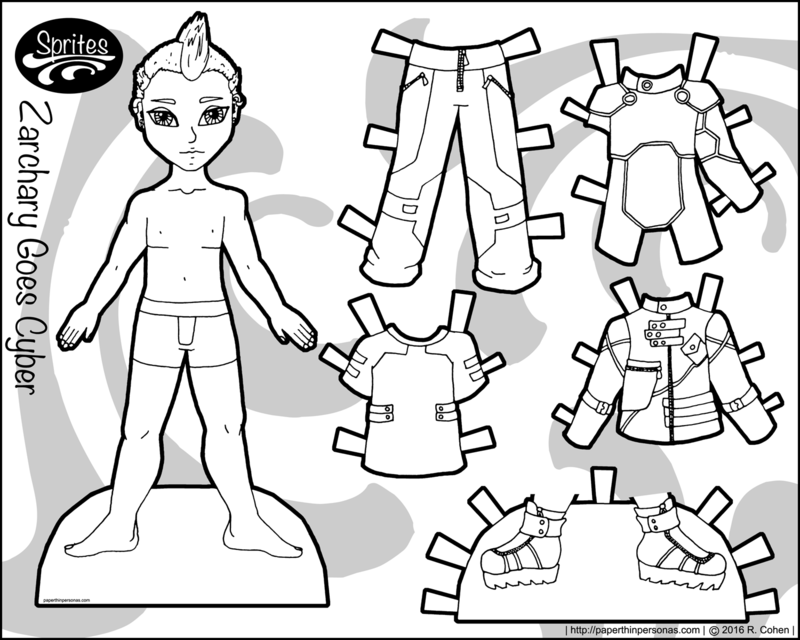 I’d love to claim I’m starting with a male paper doll to appease my readers who love male paper dolls, but in reality it was because there aren’t a lot of names that start with Z. I was thinking of using Zoe, but then I was reminded I already had a Zoe paper doll. Therefore, Zachary it was. Plus I have known several different Zacharies and they have all been delightful. So, I went pretty traditional with my cyberpunk color scheme- black, white, yellow and red. I knew I wanted to do a two toned hair style and so I liked the idea of a bleached/non-bleached look. Thoughts on the new series? Ideas for the New Year? Drop me a comment and, as always, if you like the blog, I always appreciate support through Patreon. I love it, It looks really cool! I usually don’t like the male paper dolls (no a fence intended) but I love this one, for shore! I just discovered your site last night – party plans went sour – and it’s a treasure! I am working on some comics, and the thought popped into my head that paper dolls would be a great way to try out color combos. Also seeing the clothes on a body helps with placing hemlines, waistlines, etc. Don’t worry, I won’t copy; I’m just looking for inspiration. When I was younger, I loved paper dolls! They never had enough clothes, so like you I drew extra outfits for my favorite characters. Now I’ll probably start doing it again. My comics may end up with paper dolls! Thanks for your lovely work! You’re welcome. I’m so glad you enjoy the paper dolls. I really like the color scheme and the two-toned mohawk is really cool!